ODESSA, Ukraine -- Two NATO warships have docked at the Ukrainian port of Odessa and will open its doors to local visitors as part of the alliance’s bid to show support for Ukraine’s ambitions to one day join the Western-led bloc. A British missile destroyer and a Turkish frigate have docked at the port of Odessa in Ukraine for a joint NATO maritime exercise. Ukraine, once a famously neutral state, has veered toward NATO membership since its relationship with neighboring Russia collapsed after a series of land grabs by pro-Russian forces in 2014. A poll last month found that nearly 56 percent of Ukrainians supported joining the alliance. 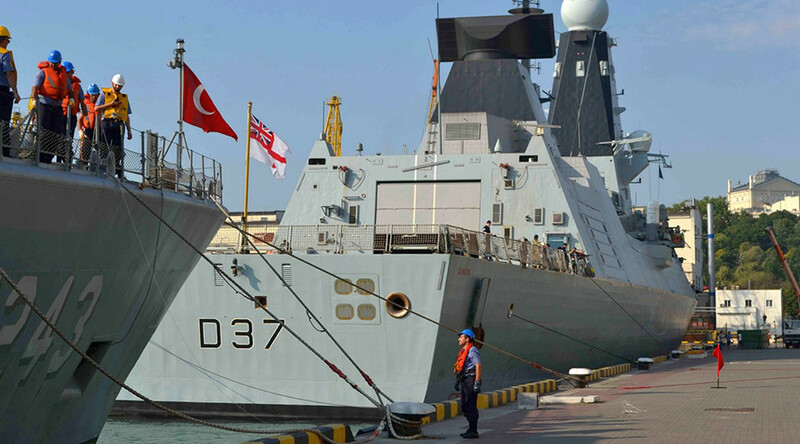 The U.K. Royal Navy’s HMS Duncan and Turkey’s frigate Yildirim arrived at the Black Sea port on Monday for a three-day stay, NATO representation to Ukraine announced on Facebook. The vessels are in Ukrainian waters following a U.S.-led drill, called Sea Breeze, in which Ukraine took part. Their purpose this week, however, is more symbolic. The NATO liaison officer in Ukraine, Alexander Vinnikov, has officially gone aboard the visiting vessels, which will be open to Ukrainians who want to get better acquainted with the navies of Kiev’s western partners. Russia has repeatedly objected to nonregional forces entering the Black Sea, taking particular issue with U.S. Navy vessels. Tensions between Russia and Ukraine are high, as violence between government loyalists and Russian-backed separatist troops in eastern Ukraine flares up every year around August. Ukraine’s president, Petro Poroshenko, warned on Sunday during a call with the leaders of Russia, Germany and France that Ukraine was entering the “bloodiest” outburst of 2017. Nine Ukrainian soldiers had died in the previous 72 hours.